The blog about the Lingopal app. And languages and travel and stuff. 1 – it’s free. Yep, down from US$9.99 and now with IAP (in app purchases). 2 – it comes preloaded with all the previous Lite app content, which pretty much means you have the equivalent of 44 Lite apps in the one app. 3 – it’s got a slinky flat design, but still stays true to the Lingopal look and feel you’ve come to love. 4 – it makes better use of features like side swiping. So now just swipe a phrase left to quickly add it to Favorites, or do the same on an opened phrase to share and edit. 5 – better playback. We were using a 3rd party tool to slow down and speed up audio playback, and now we’re using the Apple tool. It sounds better, and it’s solved a long-standing bug which occasionally caused the audio to stop playing. 6 – there’s a Store. In the top right corner there’s a new icon, and this will take you to the Store section where you can purchase individual languages, or better still, groups of apps bundled by geographical regions. N.b. – the prices indicated here are in Australian dollars. 8 – Notification feature. Don’t worry – we won’t spam! We’ve added this so we can let you know when we’re running sales and direct you to new features. For the remainder of 2014, the language bundle ‘Asia’ is on sale for just US$1.99!! That includes Thai, Vietnamese, Malay, Indonesian, Tagalog (Filipino), Cantonese, Mandarin, Japanese and Korean. 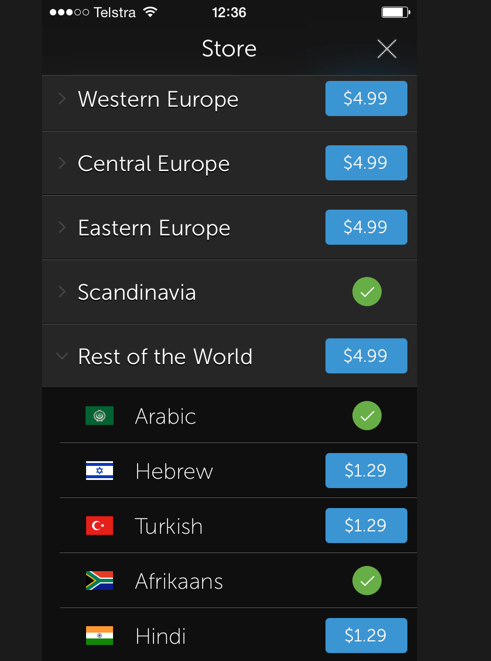 Those nine languages normally would cost US$8.61, so that’s a savings of US$6.92.